Unlike traditional brokerage firms where financial advisors fill a sales role by selling funds or stocks to fill in the various allocations (then tell clients to hold on for the long run), we center our process around adaptive and tactical investment strategies that are tailored to each individual client. We believe that any growth investment strategy should be adaptable to changing market cycles. Our investment philosophy centers around our prevailing thought about how financial markets ‘really’ work: That is, that they’re self-contained entities that simply do what they want, vs. what the outside world says they should do! Most advisors trade their clients’ assets based on fundamental concerns and risk (i.e., things happening in the world outside the markets: geopolitical events, business news and forecasts, World Bank/IMF activity, fiscal policy, Fed policy, government reports, investor-sentiment polls, etc.). Concerns that are frequently never reflected in the markets for more than a day or two or, if they’re reflected at all, the follow-on questions of ‘Starting when?’ and ‘For how long?’, can’t be answered. 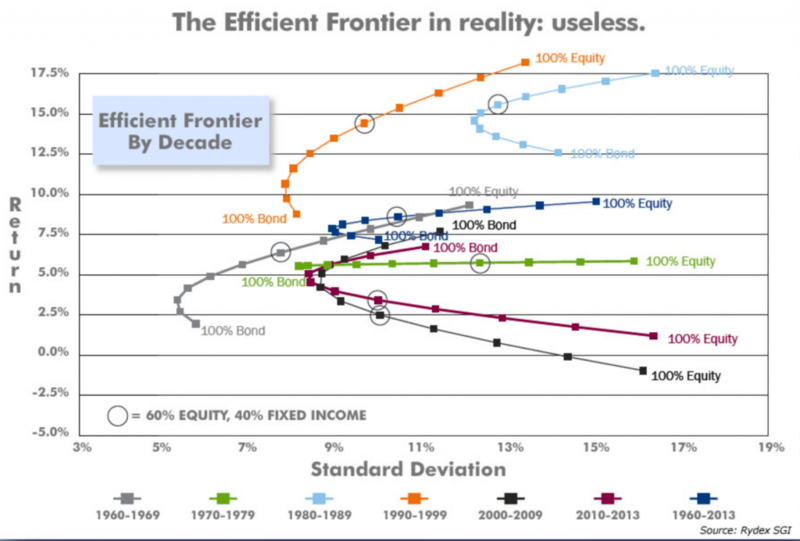 Advisors tend to also over-allocate client assets to academic-based methods; especially prominent among these is the heavy allocation of monies to certain asset classes, purely based on those asset classes’ historical performance (known as ‘strategic’ allocations) … even when those very asset classes haven’t done enough in recent time-frames to truly earn their way into current client portfolios at all. We, however, do things quite differently: We base our investment decisions on the probabilities that certain market scenarios either will or won’t unfold, purely via real-time analyses of mathematical data from inside the markets – the place where we can actually quantify a one-to-one cause and effect on investments. 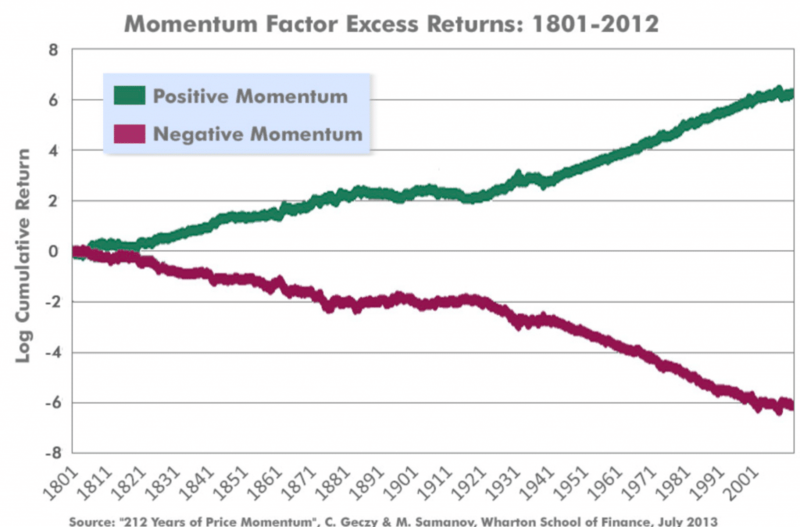 Our growth investment strategies exploit market trends that occur over multiple time frames – weeks, months and years – with momentum as the biggest input in identifying not only ‘big’ market trends, but also the relative-strength winners among the different asset classes we use – stocks, bonds, commodities, etc. – to populate our clients’ portfolios. We don’t ‘anticipate’ trends in markets or in individual asset classes; ultimately, those sorts of guesses are fraught with peril. On the contrary: We only latch-onto up or down trends when they actually come into being. Our two-step strategy of no predictions + mathematical rule-sets for entering and exiting markets and assets works, far more often than it doesn’t – and that truism largely spares the advisor and investor the type of mental anguish that’s assured to be a constant companion with other, less-reliable methods. 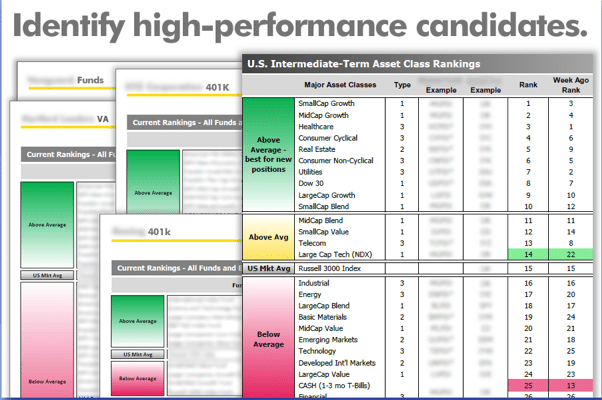 Identify high-performance investment portfolio candidates. 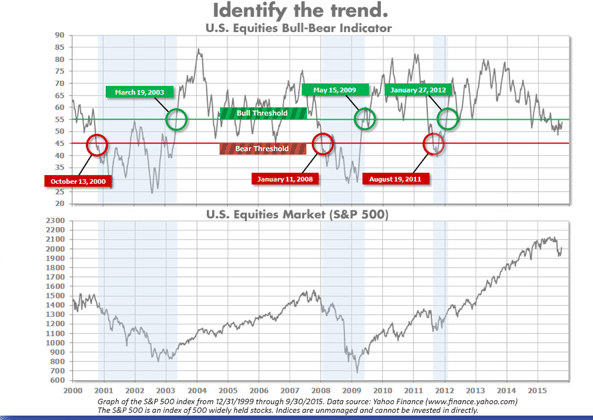 The job of the Bull-Bear Indicator is to determine when a new Bull Market or a new Bear Market has emerged. Once again, this is a measurement of ‘what is’, with no predictions or academic theories involved. Our goal is to be defensive and protected in Bear Markets and to be fully-invested during Bull Markets. Momentum, relative strength, rate-of-change, nearness-to-52-week-highs, and other measurements of performance characteristics, are all combined to produce rankings of portfolio candidates. High-performers are selected, low-performers are discarded, and the whole process is repeated at regular intervals, usually quarterly. This process of continuous self-renewal is intended to capture the benefits of long-term winners, without being dragged down by the unnecessary inclusion of under-performing sectors. Combining these two tools gives us a simple-yet-complete strategy, providing guidance on when to be defensive and when to be offensive and, when we are offensive, how to construct high-performance portfolios.